Plan Your Success: VISION BOARD PARTY 2016! A new year is almost here, are you ready? What do you want to accomplish in 2016? How will you get there? Having a clear vision about what you want is the first step to achieving your goals. A vision board serves as a visual reminder of what you want and inspires you to keep working hard to achieve it. It doesn't matter if your goals are weight loss, spiritual growth, learning a new language, starting a business or traveling to a new place. A vision board can help light the way on your journey! 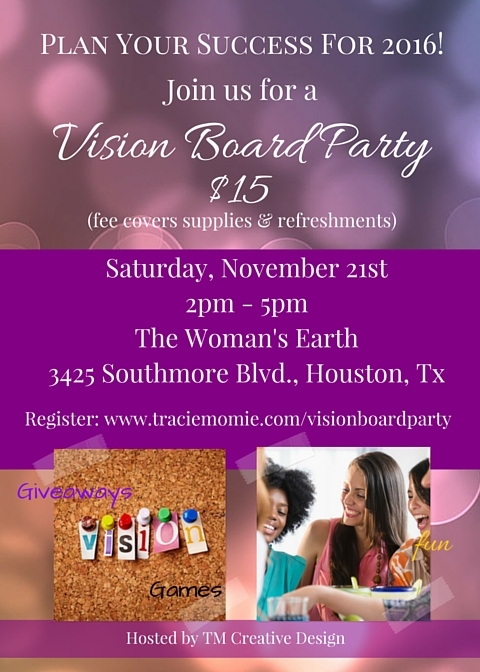 Join us on Saturday, November 21st to create your very own vision board! All materials will be provided in addition to light refreshments. There will also games and prizes!